You should be thrilled if your child shows an interest in learning to play an instrument! There have been multiple studies done that show that kids who learn to play an instrument tend to do better academically and socially. Learning to play any instrument correctly requires discipline, practice, coordination, and learning a new language (the language of music). Piano may be one of the easier instruments to get something out of that immediately sounds like music. However the learning process (and progress) can last a lifetime. Let’s get some things straight right from the beginning. 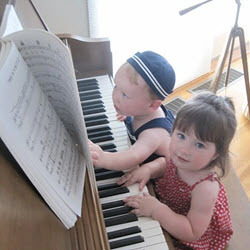 A child (or any beginner) needs all the help they can get from the instrument itself. What do I mean by this? Someone just starting down the road of learning to play needs the instrument they are learning on to be in good playing condition and if it’s an instrument that has to be tuned, like the piano, it should be kept in tune! It’s more fun to play an instrument that’s working properly, and it is better for ear training if it’s in tune. Call the Piano Tuner. 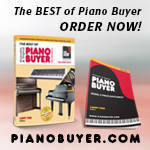 Generally speaking you are better off purchasing your piano from a trusted piano dealer or piano tuner-technician. If you just can’t afford to go that route right now, Call a Tuner before you commit to purchasing a used piano, especially in a private sale. You will likely have to pay the tuner a small fee to look at the piano for you (or with you) but it will be worth it in the end. Sure a piano teacher can give you his/her opinion too, but they usually do not truly understand the inner workings of a piano. They can however tell you how it feels to play (if it appears everything is working well). However interpretation of the sound/tone is in the ears of the beholder. If you are purchasing a piano from a private individual, after having it inspected by a tuner-tech (and perhaps played by a teacher or someone else who knows how to play) hire a professional piano move. Why? See Moving a Piano By the way, quite a few piano tuner-techs also play (I’m one of them). If you’re buying it from a piano store, ask if the bench and delivery are included, and if they will have it tuned at least once after it’s in your home. Also find out what they offer for a warranty, if any. Instead of expecting your child to muddle through on their own until they’ve demonstrated enough determination or “ability” (based on some criteria you have in your head), give them a helping hand by finding them a good teacher. The right teacher will inspire your child to practice and learn, and hopefully make it fun as well. The teacher will get them started in the right direction and build a good foundation. Going it alone in the beginning often means learning bad habits, making wrong assumptions, interpreting the sheet music incorrectly, and struggling through. This is where a teacher should be guiding and explaining, helping to make it easier to understand and to get better. While your child is learning to play the piano they will make mistakes, and some of their playing may not be so ummn, shall we say soothing. Do not be tempted to make fun of their playing, like anyone learning any new skill they could use some encouragement and support. The reward for learning to play a musical instrument is a lifetime of enjoyment. I personally love to play for parties and events, although not everyone wants to perform in public. But whether the new piano student goes on to perform for others, or mainly plays for their own enjoyment, they will experience a lifetime of pleasure knowing they can play live music. Attention Piano Teachers: You can now advertise your Piano Lesson business on Piano World for Free! Yes, free. No strings attached (pardon the pun). 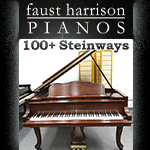 Article written by Frank Baxter, founder and host of Piano World, piano tuner, pianist, composer.